Last week I was delighted to attend the first Bedford Girls’ School Singing Recital organised by one of our visiting music teachers, Miss Middleton. Girls from Year 3 to Upper Sixth performed – in front of parents and friends – extracts from musicals, opera and the vast world of pop. Without exception each girl performed with a confidence that belied the nerves that I know many of them felt. They had learned the words, they knew the music and when they were invited to perform they did with impeccable professionalism. Parents, friends, teachers and I were taken aback by the level of delivery and felt a huge sense of pride in watching the girls perform with such aplomb. The question I was left with was where did the girls get their passion to sing and their confidence to perform in front of such a large audience? One parent gave me a clue. Her daughter, in Year 4, had been inspired by the girls in her House who had performed in House Talent. She said her daughter had watched in wonder at the older girls in her House who sang so beautifully that she wanted to try. She took up singing lessons, bought the Franklin CD and when the opportunity arose to perform took it with both hands and sang with such poise that I felt quite humbled. Whilst there has been much public outcry at the lack of positive female role models for girls today, we sometimes forget that role models for the younger girls are not necessarily adults. They can often be found in the girls themselves, particularly the Sixth Form, whose manner, conduct and in this case performance they wish to emulate. We encourage our Sixth Formers, particularly at this time of year when they start thinking of applying for leadership roles within the school, to see themselves as leaders, as role models to which impressionable young girls look up to. The Sixth Formers respond well to this challenge and are increasingly aware of their responsibility to the school community and the community at large. 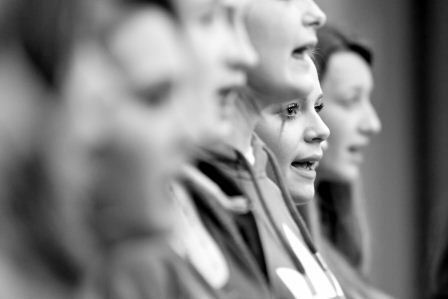 So it was with great pride that I noted that our younger girls had been led by good example to have the confidence for their singing voices to be seen and heard. It bodes well for the future of the school.